My Creative Existence: Play Date Cafe - Challenge #38. As you know, over at Inkurable Stampers this month my challenge is "Lavender and Lime". I showed you my example for that challenge back in this post. As you can see I've been playing with my Copics again! I think I'm starting to get the hang of it, thanks to my friend Dawn Lewis who has been giving me lots of tips! LOVE LOVE LOVE my new Clear Spica pen!! The "Best Wishes" is from a Fiskars stamp set called "Cameo Ovations". I stamped it on white with Violet ink. 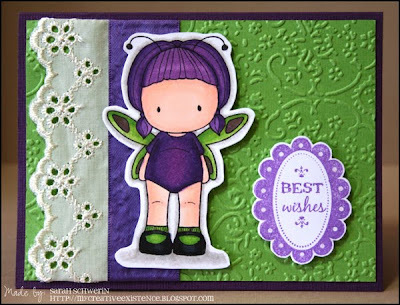 The butterfly girl and the Best Wishes sentiment have both been attached to the card front with double sided foam mounting tape. The background is lime green bazzill that I embossed using a Cuttlebug embossing folder. I attached a strip of "Broderie Anglaise" lace down the left hand side, then a piece of wide ribbon which was originally a cream colour, but I coloured it with my Copic Marker (V17). I ran the wide ribbon through the Cuttlebug embossing folder after I'd put the double sided tape on the back of it, to give it some texture. It was so much fun being a challenge participant again after being a Challenge Master at Inkurable Stampers for so long! LOL! This is my first entry for a challenge at The Play Date Cafe, so if you've come here from there thanks for dropping by! 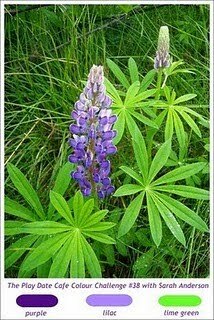 Please leave a comment so I know you've visited! I love both your pieces! So glad you chose to make a second card as a play date cafe entry. Love this cute little fairy! Too cute, wonderful coloring. Thanks for playing at the PDCC. Just darling, Sarah! 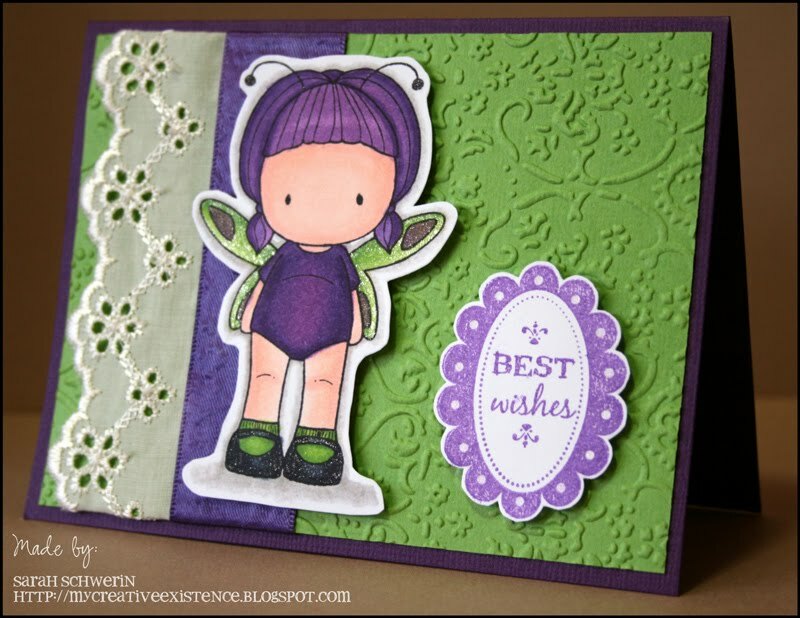 Love this sweet Sugarplum image.. Thanks for joining us at the Play Date Cafe!! Lovely coloring on your sweet image. Very pretty card and lovely design. Thanks for joining us at the PDCC! Aw she is SO cute, and your colouring is FAB! Thanks for playing along with us at the PDCC this week! She's so cute, I love her little tummy :) & that sparkly pen is a winner! !